As your play progresses you will Notice that at different points you will arrive at what are basically cusp goal Events -- Goals that can only be completed by having X number of Sims on your property or participating at any one time. With this operative system in play, what that means is that you will have to develop a strategy to move forward in building new Houses and creating new Sims as a regular part of your Game Play, at least until you have created all possible Sims you can for your current Town Level. Bearing in mind that you have to exchange time for money, and you need money to build the Houses, the first four houses/Sims that you create can easily be managed by collecting Town income and gardening, but after that the expense of simply placing the unfinished house and furnishing it with the bare necessity required for the Sim you place there to live a proper existence will mean working towards gaining income during the construction process. For example the 5th house that you place will take 2 Hours to build and cost $1000 -- so it should be placed as soon as you have the money to do that, and then while it is building you should work towards gaining the money you will need to furnish it. Bear in mind that these expenses are going to get larger as you progress in the game, so you will either need to be diligent about making sure your Sims get off to work in the mornings or you will need to buy the resources you need, right mate? Part of the process of Adding Sims is the cost of building their homes -- and this varies depending upon the level you have reached and how many Sims you have in the game. The following lists should help you to understand how this works, and therefore how to plan out your play and how to utilize your resources -- and motivate you to be there to send your Sims to work! As you can see from the sampling above, the cost in Simoleons and the time increments for Houses that are priced in Simoleons by $10K and 4 hours on average, while the cost of Life Point based Housing increments much slower, with several levels of advancement required during which the time increments for houses purchased with Life Points before the actual cost in Life Points goes up as you can see by the lists above, and for Life Point housing it is not universal -- the costs increase for the more economical housing options but the higher-end do not immediately increase. There are specific build requirements in the game that must be met in order to gain access to the different types of Industry and Businesses -- these include specific numbers of Sims, specific minimum Town Value, and invariably include specific level requirements that dictate how many Sims you can actually have in your town -- a key element in the process of building and advancing the game. One thing is well established -- your level is what dictates how many Sims you can place in your town -- so if you need more Sims in order to meet the requirement for a specific build, you will need to add them. If you cannot add them because you do not have the placement option, that means your level or Town Value is too low. Level up by completing actions or add new buildings/businesses until you see that you have unlocked another Sim slot, then add the Sim, and so on. Bear in mind that as your level increases and as you add Sims things get more expensive to add into the game -- plus the more advanced in number that choice is in each area, the more time that it takes to complete the building process. While you are rewarded for leveling with additional Sims you can place quickly early on, once you get the first 8 placed it will take multiple level-ups to unlock the next Sim. All of this should be factored into your planning as you play. I can't get the house boat as I don't have enough social points. How do you earn then quick? i have several sims that are either engaged, partners, best friends. i don't have the option to ask the other sim to move in though. so, how do i move one sim in with the other? The easy solution I've found to the adding sims cost is to move sims in with other sims and then use the now vacant house to make another sim. 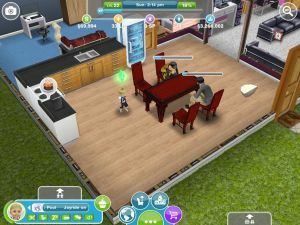 You can have 4 sims in each house (after the love is in the air quest: literally the first story quest unlocked after the tutorial is finished) and it's a good idea to leave your first couple's house vacant so you don't have trouble with adding children for other quests. You can create working dorms and then designate each dorm to a certain hobby and mill out simoleans and life points that way. You can limit your build expenses by only building a new dorm when you need a new place to mill your sims, I choose the unfurnished studio because you can add your own appliances. The only furnished home(s), in terms of beds and sofas etc, is the courtesy home where you can complete weekly quest goals and/or your first home with your only family. The dorms are filled with at least 2 appliances that can max out your sim's stat in the least amount of time. I have already added 3 sims to my town but the quest, "add sims to town" is still there. How come? What do I do so I can really achieve this quest? Even if u don't have a cat. Just add me! Need neighbors! How do you Kiss on the Cheek? What does it mean when u go up to the next level and it says "house unlocked"? How many sims can you have in a town? Yes you will, you just won'this get the special prize each quest says you can get. How do i get an arcade in my sim town cannot find it on the map? I am stuck on the engagement goal, it says 'we will even give you the ring' I'm really stuck on it and I don't know if it's because the trc devise I am playing on is old and really slow or if it is really obvious to you! How do you make 2 sims have a snowball fight? How do I make my sims marry? how to make my sims in the mood of romance? I am in a goal where i have to design clothes. HELP! How do you negotiate with a sim-eating plant? My goal is to listen to pop music on a neighbor's stereo. I have tried three times but am not getting credit for completing the goal. What am I doing wrong? How do you adopt a teen/preteen? How to make a teenager read teen celebrity magazine ??? I have magazine but does not work. You've probly reached sim limit for the standard house. Have another married couple have a baby, or relocate your household to a bigger house so they can have a third baby. I have two toddlers and I want another baby. The game says that I must move one sim out? How can I fix this without breaking up my family? to add a sim w/o a new building: you must have 2 sims at least. 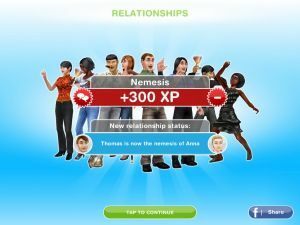 make them either partners or good friends and move one sim into the other's house. you can now tap on the unoccupied house and add another sim. btw, what is the limit of sims able to live in the same house? Where do i get a fashion design table????? I have 31 Sims in my town, I want more but game says cap is reacf I reach hed. Can I get more? I have the neighbor town and I can't reach the goals because what it asks me to do, the town doesn't have. Ex they ask me to have a preteen cram in that town, but there is no study desk and I can't access my inventory. Where do I buy Fashion Design Table? The only flaps worth I ran across is a ghost. Click on a haunted item you placed in a house and go ghost hunting until you get that one. How do u neogotiate with a sim eating plant? because I have a quest which says: build business on town mp, what do I do now? How do you make a sim without creating a building? !